Head coach James Kerr was full of praise for Banbury Bulls after they inflicted just a third defeat on South West One East leaders Maidenhead. Bulls raced into 20-0 advantage and, although Maidenhead pulled their way back to just 20-17 down, they held their nerve to seal the victory. Kerr said: “I was exceptionally pleased. We did really well for the first 30 minutes and that defined the game for us. “I would have liked us to have pushed on and scored some more points but we knew that would hard against a side like Maidenhead. 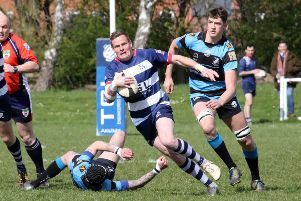 It does not get any easier for Bulls as they now travel to third-placed Newbury Blues this weekend. Kerr added: “Success breeds success and confidence is a significant enabler to winning more games. “We’re unbeaten in eight and we will take that with us but Newbury are another really tough, very good team.